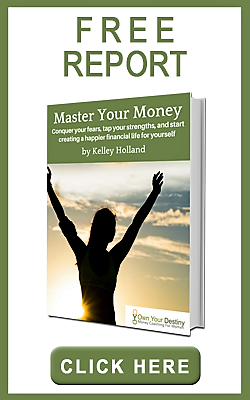 Are you interested in taming your financial anxiety and improving your “money smarts” but hesitant to commit to one-on-one coaching? Consider attending one or more of my workshops. You may be a confident, capable manager of your own finances, or you may feel woefully at sea. Either way, you may want a helping hand as you seek to teach your children healthy money habits. This workshop helps you identify your money goals for your kids – teaching them to save, helping them understand the difference between needs and wants – and explore ways to help them build money smarts at any age. We’ll talk about building solid financial values, the uses and abuses of allowances, and the hidden opportunities to teach your children healthy money habits. Midlife may look like the picture of boring stability to a teen or even a millennial. Those of us who have reached this point know better! Your forties and fifties can bring all kinds of change, from divorce or widowhood to career changes and new beginnings. All this newness can have a major impact on your personal finances and your level of financial stress, and this workshop will help you think through the money moves to bring you success and serenity during a big transition. Topics include goal-setting clarity, working with a financial advisor on your own, financing a career change, negotiating on your terms, and more. A week does not go by without some publication running a doomsday article on the state of Americans’ retirement readiness. It’s certainly true that as more employers end their pension plans, and more people enter the gig economy or start a business, many of us are putting away less than we should. But you can take steps now to improve your situation, and they don’t involve moving into your parents’ garage. We’ll talk about how to determine how much savings you need, your options for tweaking that number, and strategies for increasing your income once you stop working. Have you noticed that your elderly parent is not quite as on top of her finances as she used to be? Is she forgetting appointments or neglecting basic errands? Sadly, one of the first cognitive abilities we lose is the ability to manage money. This loss can have tragic consequences: elderly women living alone are the most vulnerable population when it comes to financial fraud. This workshop will help you initiate a conversation with the older women in your life about keeping their money safe – from predators and, perhaps, from their own diminishing judgment. This is not an easy topic. But gently entering into your elderly relative’s financial life can be one of the greatest gifts you give them. Some of the smartest high school girls in America have never learned the nuts and bolts of taking care of their finances. To be honest, many girls couldn’t care less – but when graduation nears, they start wondering. This workshop gives teenage girls the skills they need to manage their money in college, from budgeting to keeping track of their spending to finding the checking account that works for them. We’ll also talk about why it’s OK to be the “frugal friend” and how to make it happen. I include hands on exercises to keep participants engaged, and there is plenty of time for questions. College graduates and graduates-to-be are about to embark on a new life chapter that promises to be full of adventures and exciting change. It’s also a time when financial life concerns change from “who’s buying the pizza?” to “what the heck is a 401(k)?” This workshop will help recent graduates and graduates-to-be organize their finances for real life. We’ll talk about the easiest way to increase your savings by $100,000, how to decide between buying and renting a car, how to make yourself a good candidate for a credit card, lease, and more. With a vision and passion for educating young women to be financially literate and independent, Kelley has become a significant part of our program. Her in depth knowledge of the big picture of financial competency and her awareness of personal nuances allow her to make each person comfortable, even in a large workshop. Her ability to make age appropriate and relevant connections and create a sense of immediate usability of information inspires the students to take action immediately. Her presence brings calm and inspiration; our students are deepening their skills to be on a path that allows them to experience financial confidence.